Copyright © Personalized Gifts. Images used with permission. LIMITED TIME SALE - 20% Off! Whether they favor a lager, ale, malt or light beer, they'll toast you whenever they pour themselves a cold one. 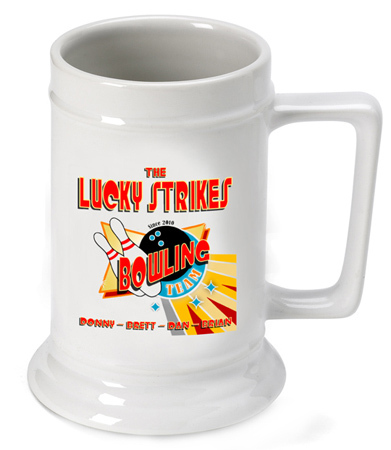 Each personalized white ceramic mug holds 16 ounces of their favorite beverage. These beer steins are dishwasher safe. Dimensions - 3" x 5 1/2" x 5"
Do you want Rush Processing? Do you want to include a gift message on the packing slip? Do you want to include a Hand-written gift message? If yes, what should it say?